Could a village in Colombia, devastated by Alzheimer’s like no other community, generation after generation, provide clues toward developing a cure for the disease? Dr. Pierre N. Tariot, the director of the Phoenix-based Banner Alzheimer’s Institute, is among researchers who believe so. Speaking at the annual Matthew & Marcia Simons Symposium on Alzheimer’s Disease on Nov. 9 in Newton, Massachusetts, Tariot displayed a pedigree chart reflecting the misery of the town of Yarumal. “Roughly every other person was laid low with Alzheimer’s,” Tariot said. “You can see it in every generation,” dating from the 1640s. Historians have long understood that diseases brought from Europe, such as smallpox, were ruinous for native populations. But the Spaniard who founded Yarumal did not bring a sickness that killed people quickly. Far from it. Because of a genetic mutation carried by the founder, the village’s plight over the centuries has been far-reaching. 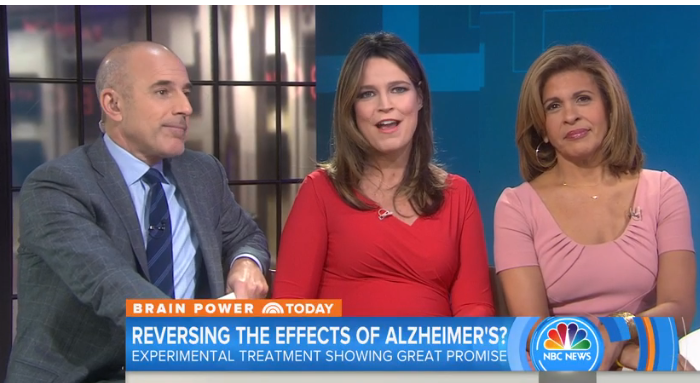 And that has made it important to Alzheimer’s researchers. As the New York Times reported back in 2010, people in Yarumal show symptoms of Alzheimer’s as early as their early thirties. The typical resident with the disease has severe symptoms by age 47. One man, a reporter noted, “babbles incoherently, shreds his socks and diapers, and squirms so vigorously he is sometimes tied to a chair.” Another man was in denial about his condition, and when he was sent to the market to buy two basic staples—bread and milk—he was able to remember only one of the two items. Could any good come out of this suffering? Not for the villagers who are dying in agonizing and humiliating ways. But there may be hope for their children and their descendants. Rowan Hooper, writing in the journal New Scientist about a year ago, noted the work of Kenneth Kosik and his colleagues at the University of California at Santa Barbara. Hooper cited a process called “identity-by-descent analysis.” Because Kosik’s team had information on the genome sequence around the Yarumal mutation, they were able to apply the approach to the town, to get a better sense of how people in the study were related. “It’s hard to explain why all these people would share a large chunk of DNA, if there hadn’t been a common founder,” Hooper wrote. The scientists appear to concur that the village’s founder, a conquistador who founded Yarumal around 375 years ago, brought the fateful gene with him. The strangeness of the disease is captured by a detail in One Hundred Years of Solitude by the late Colombian novelist Gabriel García Márquez. As Hooper noted, residents call the disease La Bobera (foolishness), the kind of term that characterizes the real-life town of Yarumal. In an article in the British newspaper The Telegraph, Michael Jacobs reflected on the eerie similarities between the forgetfulness of García Márquez’s characters and the real-life people suffering in Yarumal. What is the likelihood of this previously obscure village being the place where crucial insights are learned about Alzheimer’s, including slowing the disease’s pace? Dr. Tariot told his audience in Newton that the key to stopping Alzheimer’s is to prevent it well before symptoms surface. Yarumal’s unique genetic pool could shed light on an approach that could lead to a cure. That, of course, would not directly help those of us who already have been diagnosed with the disease. But that is beside the point. It’s our children’s generation who have the promise of a future when Alzheimer’s will have become a manageable disease. And, of course, the Yarumal residents would, over time, begin to escape from the plague that has shortened the lives of their ancestors for centuries. Back in 1999, Jay was diagnosed with clinical depression. He recalled, “I didn’t know what was going on. Just that every day I was waking up and thinking, ‘Well, maybe I’ll die today and I won’t have to deal with this.’” Depression, he discovered, can be an early sign of Alzheimer’s. In 2002, he was diagnosed with mild cognitive impairment, often a precursor to Alzheimer’s. Jay was devastated. He had a prosperous law practice and what he described as a photographic memory. But then he began forgetting things. Alzheimer’s runs on both sides of his family, so he knew that he was at risk. Over the next four years, his weight ballooned from a trim 190 pounds on his six-foot-two frame to 245. “My brothers and sisters thought I was faking, and I was also regressing,” Jay recalled. “I didn’t know what was going on, either. Just that every day I was waking up and thinking, ‘Well, maybe I’ll die today and I won’t have to deal with this.’” Jay’s doctor advised him to close down his law practice, and when Jay asked how soon, the answer was, “immediately.” It took a year and a half to wind things down. Over the years, Jay has aggressively sought out participation in clinical trials, in the hope that he could reap the benefits of the drug candidates before they received FDA approval. His earliest clinical trials came soon after his diagnosis. At that time, some researchers thought that the first symptoms of Alzheimer’s could be detected through the hippocampus, the seat of short-term memory, which in cases of Alzheimer’s is typically the first part of the brain to experience decline. One of Jay’s earliest clinical trials was under the direction of the Alzheimer’s researcher Dr. Dennis Selkoe at Brigham and Women’s. In Jay’s view, if he had to walk the path of the disease, someone else should learn something from it. About five years ago, Jay qualified for a modest drug trial with roughly 200 participants. By then, he was much more social, his depression long behind him. Dr. Selkoe didn’t think Jay would score low enough to qualify for the trial, but in fact he did. “I continued to function, in spite of this chemical imbalance in my brain,” Jay said. “Over the next two years, I kept feeling better and better.” At the end of the five years, they terminated the study. 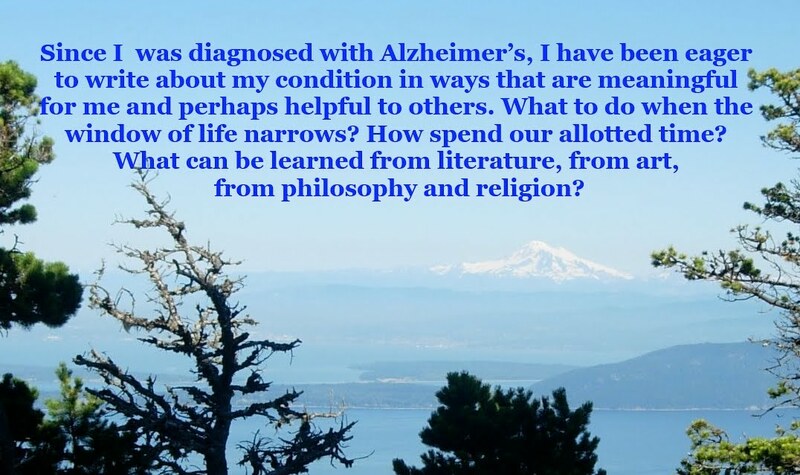 Are there lessons to be drawn from Jay’s long experience with Alzheimer’s? As one doctor of his said, “You should be mildly demented but you’re not.” Jay’s experience is highly atypical, of course, if not downright freakish. But one practice of his—intense aerobic exercise on a daily or near-daily basis—is something that can benefit many of us who have the disease, in the service of forestalling our way to our murky destination, a depot where no one wants to arrive. If you have early-stage Alzheimer’s and want to know what you can do that might forestall the disease’s progress, you’ll find plenty of information on the Internet. The challenge is sorting out the wheat from the chaff. It has become conventional wisdom that a “Mediterranean Diet”—featuring lots of seafood, yogurt, olive oil, nuts and grapes, along with leafy greens such as kale and spinach—is a good thing to follow. But it appears that Dr. Dale Bredesen, a neurologist at UCLA, has furnished evidence that certain dietary and lifestyle changes may not only slow down the pace of the disease but reverse it. 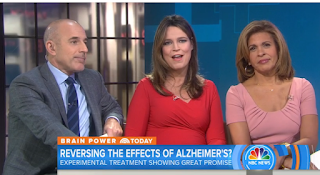 Early this week on the Today show, Bredesen spoke about his research, bringing encouraging news to a wide number of viewers. An abstract of the study, published two years ago, describes a personalized therapeutic regimen that, beyond sound nutrition and lots of aerobic exercise, also focuses on good sleep hygiene. To maximize sleep’s restorative power, Bredesen recommends fasting for at least ten hours after dinner. That rules out evening bowls of cereal or midnight snacks. The abstract of the study notes that all but one of the ten subjects showed cognitive improvement during the trial, and that person was already at a later stage of the disease, too late for the approach to help. Most strikingly, six of the ten patients improved enough during the drug trial to return to work. Improvement, either subjective or objective, was noted. The study gives hope that something as simple as tweaking one’s diet and exercise regimen, along with good sleep hygiene and lots of mentally stimulating activities, can forestall cognitive decline. Movies about Alzheimer’s are more numerous than I realized. Back in 2007, Roger Ebert mentioned he had reviewed five such movies in the first seven years of this century. They included Iris, an elegiac biopic about the superb British writer Iris Murdoch, who died of Alzheimer’s in 1999. The most memorable scene in Iris comes when Murdoch, played by Judi Dench, blanks out during a live television interview. A movie that came out in 2006, Away From Her, featuring Julie Christie, and directed by Sarah Polley, struck a very different tone. Unlike the 2014 movie, Still Alice, featuring Julianne Moore as a Harvard linguist who has a rare and fast-moving variant of the disease, Away From Her depicts a woman who finds the disease liberating. Not that Fiona needs encouraging. She and her husband live in rural Ontario, and when she gets lost in the woods while cross-country skiing, rather than panicking, she throws herself on her back and stares up at the snow falling from the boughs overhead, as if she were making a snow angel. Grant dutifully retrieves her. The ironic style of this film derives from the Canadian author Alice Munro, one of Paula and my favorite writers, and the winner of the 2013 Nobel Prize in literature. One of Munro’s stories was the basis of Away From Her. A key point in the movie comes when the decision is made that Fiona can no longer be trusted to live without assistance. One scene depicts her leaving a burner on, risking a fire, and soon preparations are underway to transfer her to a care facility. And, rather protesting the decision to leave her home, she embraces it. It turns out that the pricey care facility has a rather odd policy about loved ones: No one can visit until 30 days have passed. As I was watching the film, I thought, how awful it must be to be dumped in a nursing home, no matter how upscale, and not see your loved ones for an entire month. And much can happen in that span. The surprise comes once Fiona is reunited with her husband Grant (Gordon Pinsent). Grant soon grasps that she is enjoying herself—too much, in fact, in Grant’s view. Early on, the film makes clear that Grant, a former college professor, had a long career as a philanderer. It is only in his senior years that he has been loyal to Fiona. Now, at the care facility, he quickly learns that Fiona has become romantically involved with one of the male residents. Grant himself strikes up a friendship, or at least a confidence, with a middle-age care attendant. Only fleetingly does this movie pause to let viewers see the unpleasantries which await people with Alzheimer’s in the terminal stage. This is one cheery Alzheimer’s film.